For hundreds of years, brides have been given a horseshoe to carry on their wedding day and bring luck to their new marriage. But have you ever wondered how this tradition started? Horseshoes have long been considered lucky. In fact the roots of the lucky horseshoe tradition can be traced all the way back to ancient Greece where it symbolised the crescent moon, which was regarded as a symbol of fertility. In pre-Christian times it was also thought that iron could ward off evil spirits. Although horseshoes are now generally made from steel, they were originally forged in iron, which folklore dictates keeps away spirits and fairies. They were also held in place with seven nails, seven being the luckiest number. The superstition acquired a further support from a Christian story, the legend surrounding the 10th century Saint Dunstan who worked as a blacksmith before becoming Archbishop of Canterbury. The story goes that Saint Dunstan was working in his blacksmith’s forge when the Devil appeared. Saint Dunstan is said to have trapped the Devil with his blacksmith’s tongs and as a result extracted a promise never to enter the house of a Christian, which he would recognise by a horseshoe hung above the door. It is said that because the horseshoe is “U” shaped, to retain the good luck forever it is essential that the horseshoe is hung by the ribbons which are attached to the shoulders. The horseshoe should not be turned upside down or else all the good luck of the marriage may fall out. Wedding Horseshoes make all of their gifts from real horseshoes, forged by a blacksmith, to ensure the most luck possible for the brides who carry them. When you order your horseshoe from us, you’ll get a genuine, traditional steel horseshoe that’s completely personalised for you. Prices start from £23.90. 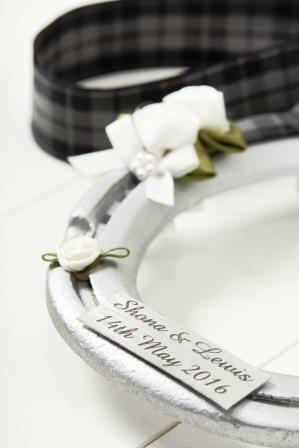 We are especially popular with Scottish brides as we are able to source any tartan for the decorative ribbons on the horseshoes. Check this out loanora.co.uk offer help to your financing with lower interest and quick process.